Here the beast, (man as Satan’s agent) was given power to make war against the saints, and to overcome them. How can this be, since the saints are “more than conquerors” in Christ? Surely the “new man” cannot be defeated by the beast. It must, therefore be the “old man.” The “new man” reigns with Christ, but to do so, he must first be “beheaded.” How can Christ be our head, if we still have our old one? So Satan is in the business of beheading the “old man.” As it was with Christ, so it is with us, if he had known the result, “he never would have crucified the Lord of Glory.” The beast can only do what Satan empowers him to do, and he only says what Satan says…This war against the saints is Satan’s idea. 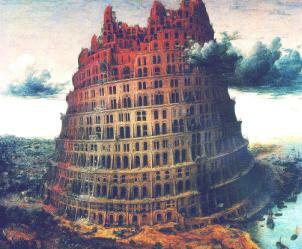 Whose idea was it to build the tower of Babel? It was Satan’s idea. They did it because they thought that they would be scattered if they didn’t have a name and a building. It was a variation on the same lie that the serpent told the woman in the Garden. It was the wrong name and the wrong building. It has something to do with builders. It does not say, “the stone that some of the builders rejected…” Jesus is the stone that all of the builders reject, because it is either His building or theirs. He is the only one who can build His building. All man can do is submit as building material or mess it up when we try to help. As soon as we build anything, we have something to lose, and so are compromise. The war against the saints is a war against God’s building. God builds with living stones, and He builds by placing them in right relationship with one another. It is right relationship under God that is the focus of the beast’s attack or warfare against us. “And because iniquity abounds, the love of most will grow cold.” It is the Love of Christ that binds us together in right relationship. Iniquity is a weapon against love. If we claim to be lovers but have not love, we are dead meat or if the love that we have is not God’s kind of love, i.e. the love that was redefined at the cross, then our love cannot overcome iniquity. The “old man” is incapable of God’s kind of love. Only the “new man” of Christ in us is capable of a love that is more than a conqueror in the face of iniquity. It can only be that the beast has the power to make war against the saints to overcome them because the saints are trying to muddle through with the wrong kind of love. We must be beheaded of that muddle-headed kind of love, and the beast, inspired and energized by Satan, is God’s instrument for the completion of that task. It is the task of the cross, and He who began this work in us, to finish it in us. If our being one, “as Jesus and The Father are one,” is the way He has chosen and prayed “that the world may know..,”, then our loving one another in that oneness is the greatest possible threat to Satan. It is no wonder that the builders do everything possible to alienate us from Christ in each other, They want us to be zealous for them and their buildings. In my experience, the war is horrendous. This entry was posted in J.Ferris: New Releases, J.Ferris: Warfare against Intimacy and Conversation. Bookmark the permalink. Pam thank so much for posting this at this time. I needed to refocus…Deborah Peterson, N.Y. So great to hear from you, Deborah! Jay adored you. I wish I had gotten to know you better when we all first met. What a time that was!